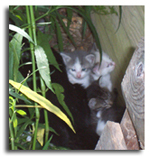 While cutting down the weeds in the backyard, I found a mother cat with four baby kittens. I debated whether to tell my children because they want to adopt every kitten that declares our property their home. But I could not resist...they all know...can't you hear the oohs and ahhs?